Serendipity, I am in love with such a cool concept. An underlying theme throughout this "Nulla Dies" blog. Personally, I also enjoy the Japanese term 大冒険 (daibouken, DIE-BOW-KEN) which means "great adventure." Quite often, I think to myself, "Today's another great day for a daibouken." The pretext for today's daibouken: Three years ago, the last time I visited with my aunt and cousins here in Japan, I attended the basketball practice of one of my 5 Japanese-American cousins. Team name: Matsudo Bears. Grade school ball. I had the good fortune of meeting a parent of another player. A Japanese man, nickname: Mitch. Mitch was and still is the head of the Bioinorganic Chemistry department at Japanese largest and premiere University, Tokyo University [Toudai (pr. TOW-die) for short]. After explaining my interest and personal background in Science studies, Mitch offered me a tour of his lab and the Toudai campus. I was not able to accept his invitation due to conflicting schedules. That is, until today. 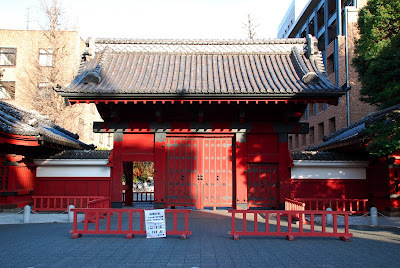 Today's Daibouken: Having arrived about an hour early to the Tokyo University campus, I did as I always do with extra time on my hands, I followed my feet. Today I was led to the Tokyo University Hospital. Previously, I cemented a die-hard interest in medical history when I took an elective course at UW-Madison entitled Medical History and Pharmacology as presented by Dr. Scarborough in the UW Pharmacy School. So, when I discovered the Tokyo University Hospital museum, I was overjoyed. I spent that hour reading up on the history of the Hospital. With such a rich history of innovation and discovery within the medical realm, I couldn't possibly begin to relate the finer details of my findings. However, I will describe the following encounter. As I sauntered around the museum to the various displays I came across one describing the origins of the colorblindness test. You know, that book of about 20 pages with tiny multicolor dots with a number in the center. 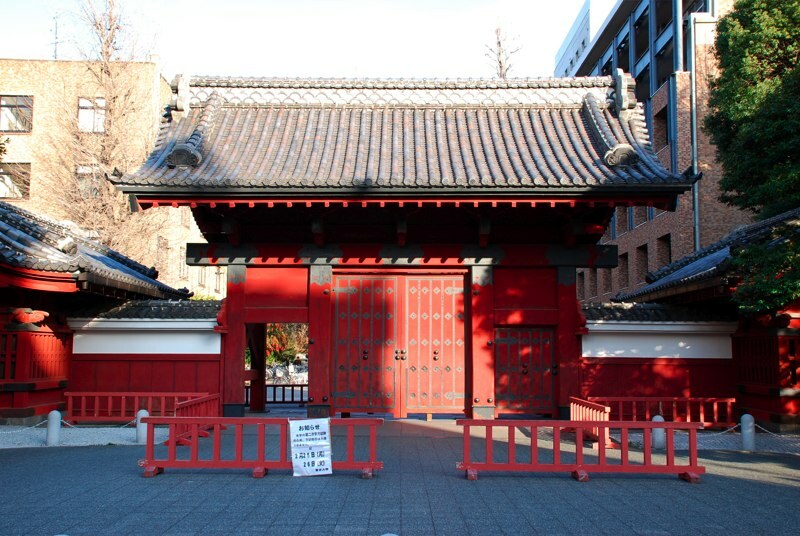 Well, you guessed it, origins of that test are in Japan at Tokyo University. An example of the test was on display. 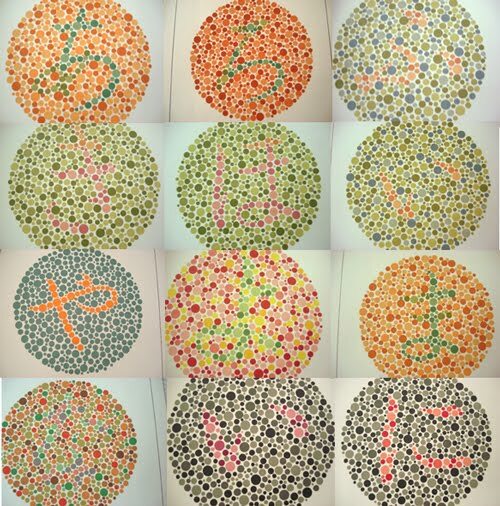 The original test used Japanese characters, hiragana, instead of numbers as we use in the West. 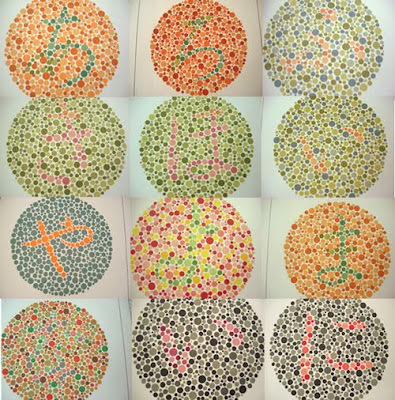 色覚障害試験(しきかくしょうがいしけん）の例: An example of the Japanese Ishihara Test for color-blindness. As I was standing there reading the display's description, an elderly Japanese man, short in stature with an edified air about him, came up beside me to read the display. At the same moment, we both turned to the book of dots. Having just failed the test two weeks prior with less than 50% I had a keen interest in this display. I have always done poorly with color recognition. I have even made it habit to consulate others when coordinating dress shirts and ties with my suit. Anyway, we both look at the book on display. This man turns to me and tells me in Japanese and broken English that he can't see the hiragana at all. I exclaimed, "Me too!" as if I had just met a kindred spirit. We proceeded to take the test together, laughing like two old friends when neither of us could discern what was on the page. Then turning to the answer and description, again written all in Japanese, we laughed some more. If an English-only speaker had been there standing with us, this is the impression of a dialogue I imagine they would have had. Old man: Oh I can't see anything at all! Jon: You too? I can't see anything either, haha! J: You are colorblind? Me too! Let's be friends. O: Haha, ok let's be friends. But I digress. As with all good things, my time with Ojiisan came to an end. We said our good-byes and parted ways. He continued on with his tour of the museum and I left to meet Mitch for lunch and a tour of the Campus and his lab. The latter part of this particular Tuesday was an adventure in and of itself, and to Mitch: I am grateful, sir, for your generous spirit and kindness. Perhaps another entry I will dedicate to you. But for all intents and purposes, I dedicate this passage to my "chromatically-challenged" friend, Ojiisan. Thanks for sharing a few laughs Old Boy.